Overview - A woman transformed into a giant after she is struck by a meteorite on her wedding day becomes part of a team of monsters sent in by the U.S. government to defeat an alien mastermind trying to take over Earth. To tell you the truth, I'm not all that big a fan of aliens. When I was twelve in the summer of 1989, I was abducted and brought aboard a mothership where I was studied for a few hours and then returned home to go on my merry way as if nothing had happened. Okay, I can't even type that with a straight face. The real reason is that we've reached a point in film history where we're so saturated with these intelligent beings from other worlds that it's just not interesting anymore. Every year a bunch of films on the subject are released, and one of my main pet peeves is when a movie totally jumps the shark by bringing in extraterrestrials to explain the plot, as if the writers wrote themselves into a corner and couldn't come up with something more original. Yeah, you know who you are. Monster movies on the other hand, now there's something I adore. Yep, give me a romping, stomping, creature-feature any day of the week. I'll even take beasties from other planets, so long as they fit within the parameters of a monster profile (i.e. 'Alien,' 'Predator' etc.). So naturally, I found myself drawn to DreamWorks' 'Monsters vs. Aliens.' Sure, the film doesn't quite have the magic of the Pixar releases, but it does a great job in paying homage to the science fiction of yesteryear. Plus, when our home team of monstrosities is given the opportunity to kick some foreign space invader booty, it nearly brings a tear to my eye. The story begins when a young woman named Susan Murphy (voiced by Reese Witherspoon) awakens on the happiest day of her life--her wedding. Susan's dreams of tying the knot with her weatherman fiancé Derek (Paul Rudd) evolve into a nightmare when a meteorite hurling towards Earth enters the atmosphere and makes a beeline straight for the bride. The side effect causes Susan to grow to a monstrous size, which prompts the military under the command of General W.R. Monger (Kiefer Sutherland) to spring into action. Susan soon finds herself imprisoned in a secret government facility where she meets fellow societal outcasts including the brilliant mad scientist Dr. Cockroach (Hugh Laurie), a macho half-fish/half-ape called "The Missing Link" (Will Arnett), the gelatinous one-eyed blue B.O.B. (Seth Rogen), and a giant grub-like creature referred to as Insectosaurus. Now dubbed Ginormicus, Susan sadly learns she may never see Derek or the outside world again. But as fate would have it, when an alien invasion led by the overlord Gallaxhar (Rainn Wilson) threatens the Earth, the monster squad is deputized on orders from the President (Stephen Colbert) with the chance to earn their freedom by saving the planet. The story for 'Monsters vs. Aliens' is pretty straightforward, but I kind of like it that way. The film takes the bulk of its inspiration from classic 1950s horror films as we can clearly see by the designs of the main characters ('Attack of the 50 Foot Woman,' 'The Fly,' 'The Creature from the Black Lagoon,' 'The Blob,' and 'Godzilla,'), and those films were never really complex to begin with. The writers kept things simple and concentrated on the humorous elements, but were still able to craft a decent storyline with interesting characters and a twist or two some viewers may not see coming. Sometimes, when things get a little hectic it can actually detract from the movie, so I'm glad it worked out this way whether it was intentional or otherwise. The voice casting was very well done and I thought it was put to much better use than in some of the previous DreamWorks animated films. Witherspoon brings enough sweetness and innocence to Susan that the viewer can care about her and her "big" problem, but the real stars are in the supporting roles. If I was in need of someone who can pull off an intellectual genius, Hugh Laurie ('House M.D.') would have been my first choice, and his Dr. Cockroach also comes with the same megalomaniacial aura as Stewie from 'Family Guy.' While Arnett wouldn't have been on my go-to list, there wasn't anything I disliked about his performance. Sutherland and Colbert also seemed to be reveling in their respective roles, and I'm sure Colbert must've had a heyday playing the President of the United States. The show-stealer is Seth Rogen, though, who perfectly captured the brainless B.O.B. It's hard not to chuckle at his sharp one-liners and contagious laughter, so he helped sell the movie for me. Oddly enough, the main strength of 'Monsters vs. Aliens' is also probably is its biggest flaw, and that is the usual barrage of pop culture references, which this time strictly adhere to sci-fi themes. The downside to this is that it corners off the playing field, so if some viewers aren't familiar with the genre then many laughs are bound to go right over their heads. For instance, I actually had never seen 'Close Encounters of the Third Kind' up until a couple of months ago, so I got the nod to that movie. But if I hadn't, I'd be clueless. Fortunately for me I was able to make most of the connections (although a couple did still slip by me which I discovered later), so I can imagine what it must be like for non-sci-fi fans. No, 'Monsters vs. Aliens' isn't a perfect film, but it was better than I had expected. I think a bit more character interaction to tug at our heartstrings may have been enough to ignite a magical spark, and depending on the level of the viewer's familiarity with the films being poked at, it will definitely affect the overall experience. As for kids, 'Monsters vs. Aliens' has plenty of color and action to keep them entertained, so like B.O.B. -- picking this release up for them is easily a no-brainer. 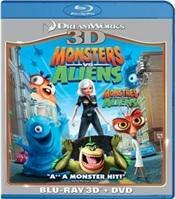 For over a year, Paramount and DreamWorks Home Entertainment have made the Blu-ray 3D edition of 'Monsters vs. Aliens' available exclusively only to Samsung 3D home theater products. The Region Free, BD50 disc appears identical to that release except for the added 'Puss in Boots' preview. It also arrives with new cover art that resembles the one seen on the regular BD edition and housed inside the normal blue keepcase with a DVD-9 on an opposing panel. At startup, viewers are taken straight to the main menu where they can choose between the 2D or 3D version of the film when pressing "Play." 'Monsters vs. Aliens' was made as an intentional celebration of 1950s sci-fi creature features, including the fun of watching them in 3D, so it's no surprise to see the movie filled with lots of gimmick effects throughout. In fact, the entire movie feels like one big, giant gimmick, with exaggerated levels of depth that are equally astounding to watch, like looking into a picture book with several layers. There's a genuine sense of constant three-dimensionality from beginning to end, where objects in the far background truly seem like they are at a great distance. Nearly every frame in this 1080p/AVC MPEG-4 encode (2.35:1) could serve as a demo piece if not for the noticeable, pesky ghosting present in the second half of the movie. Still, the 3D presentation puts on a wonderful and often astonishing show. Arms, hands, and other odd items seem to move independently of everything else, like an early scene with the general on his little hovercraft coming in and out of the screen as circles around Susan. The effect is put to great use whenever Susan extends her arm to reach for something or when B.O.B pops out his eye. An especially fun moment is right the beginning with the S.E.T.I scientist playing paddle ball, a hilarious reference to the original 'House of Wax' with Vincent Price, the first 3D color movie and the start of the 3D craze during the 1950s. Like other aspects of the video, this is one of the best "pop out of the screen" moments I've yet seen in the format. And it's awesome! As for the rest, the dark glasses do nothing to diminish the transfer's other, truly excellent qualities. The color palette is most apparent as primaries are rendered with stunning brilliance and intensity while the softer hues add a dazzling glow to the animation. Contrast is right on the money and crisp, allowing for the tiniest feature on characters and architecture to be plainly visible. Fine object details and textures are extraordinary, perfectly demonstrating the great work CGI artists put into making this movie. Hairs on the giant bug's body are sharply distinct, minor facial blemishes on the humans are revealing and the inside of Gallaxhar's mother ship is terrifically well-defined. Black levels are inky rich with exceptional shadow delineation. Other than the aforementioned ghosting, which weirdly seems more pronounced in the second half of the movie, 'Monsters vs. Aliens' is a great and highly enjoyable showstopper on Blu-ray 3D. And the fun doesn't stop there with this reference level Dolby TrueHD soundtrack that can sure pack a wallop once it gets going. The front soundstage displays a wide, open expanse that's engaging with precise, intelligible vocals. Some of the best scenes are of course with the giant robot's destruction of San Francisco, where we can hear every brick, rock, and piece of debris flying by. Directionality is absolutely flawless with clear, fluid movement throughout the system, creating a wonderfully immersive 360-degree soundscape. Dynamic range remains incredibly sharp amid all the loud action, clearly differentiating between the small, subtle mids and the room-penetrating highs. The low-end is commanding, providing each explosive scene with wall-rattling weight. Rear activity also delivers several moments of discrete effects, generating a convincing ambience that's satisfying. All in all, the lossless mix is a terrific blend of endless cartoon activity and fiery sci-fi action, making it a tremendous listen for fans. After over a year of being an exclusive to Samsung 3D products, 'Monsters vs. Aliens' comes to Blu-ray 3D as a bare-bones release with a 3D preview for DreamWorks's latest animated feature, 'Puss in Boots.' The only other addition is a DVD copy of the movie. As a celebration of 1950s sci-fi creature features, 'Monster vs. Aliens' is an entertaining throwback to classic 3D cinema. Headlined by Reese Witherspoon, Seth Rogen, Will Arnett and Hugh Laurie, the CGI-animated picture makes for an amusing romp for the whole family with several laughs and a satisfying story. Finally available on Blu-ray 3D, the movies arrives with exceptional video and reference level audio, but arrives missing the bonus collection from the 2D edition. In the end, it's a great purchase for those hungering from some 3D HD goodness.